Motocross is an exciting, dynamic sport. It’s also risky, which is a big reason why it’s so appealing. 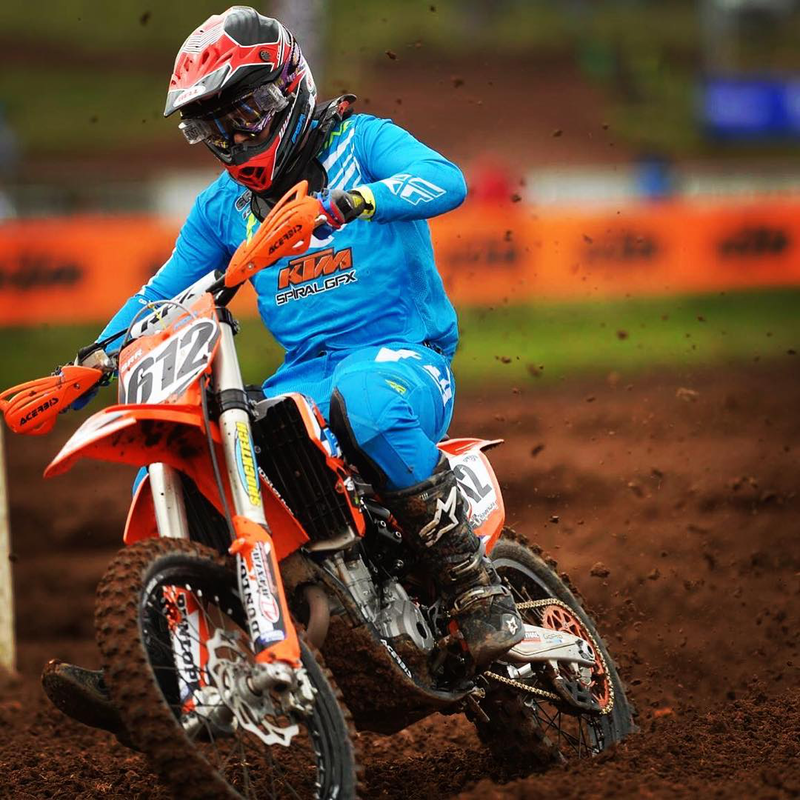 Since even the most experienced riders risk injury, it’s important for a rider of any level to have the best quality motocross gear possible. The right motocross helmet can help protect you from injury – and worse. No matter how much of a risk taker you are, you should never compromise your safety. The more protected you are, the more adventurous you can be when out on the track. Your helmet may be the most critical piece of motocross gear to invest in because it protects both your head and your face. Plus, a helmet that fits properly will keep you comfortable and dry as you ride, making it easier to focus on the course without getting distracted. In this motocross helmet buying guide we will look at how to measure, fit, choose and buy the right mx helmet for you. It’s important to know how a motocross helmet differs from other types of motorcycle and bike helmets. The main difference is that motocross helmets have extra space to fit all of your protective face gear. The chin portion of the helmet is distinct as well – it’s extended in order to protect you from any debris that may hit you as other riders make their way around the course. Motocross helmets also have special venting, and many of them are designed with sharp, eye-catching graphics. Motocross helmets are designed with a liner that absorbs the energy from a crash or another type of impact. This liner will compress and disperse the energy from the impact in order to lessen the effect on your head. Once the liner has compressed once, it’s no longer effective – you’ll need to replace the helmet in order to stay safe while riding. We’ll revisit this topic a bit later when we talk about knowing when to replace your helmet. Compatibility with the same manufacturer’s neck braces for extra protection. Durability, usually by way of a carbon fiber shell. Polycarbonate helmets are also durable and tend to be extra lightweight. Label that says that either British Standard 6658:1985 or UN-ECE Regulation 22.05 is satisfied. The label should be on the inside of the helmet or on the shell. Light, fluorescent colors and reflective strips to promote better visibility during the day as well as at night. Moisture-wicking technology to keep you dry throughout the day. Look for lining that can be removed and washed. Omni-Directional Suspension (ODS), an in-helmet system that works with kinetic energy and suspension to absorb energy, reducing the impact that’s transferred to the head. Rotational force protection to protect brain tissue. High SHARP rating, which is a government program that provides safety ratings from 1 to 5. SHARP ratings take into consideration how a helmet will be impacted in different regions, at different speeds and with different surfaces. The higher the score, the better. Note that SHARP only assesses helmets that have met regulatory requirements (British Standard 6658:1985 or UN-ECE Regulation 22.05). V-Foam lining to absorb extra energy upon impact. This technology also makes the helmet lighter than many other models. Venting in the back and the front, including exhaust vents and intake scoops for optimal air flow. A Note About Price: When it comes to cost, the time to look for a bargain is not when you’re buying a motocross helmet. A good helmet won’t be inexpensive – if it is, it could be because it’s lacking an important safety feature. For example, you want full-face coverage, which is more expensive (but also more protective) than a helmet with a bolt-on mouth guard. With full-face coverage, your face and head will be better protected from side or front impact. Also, you should never purchase a secondhand helmet or use someone else’s helmet. Even if looks like it’s in good condition, you won’t know if there’s any internal damage done to the protective material that you can’t see. Remember that while appearance is important, especially for improving your visibility with bright, bold colors, fit is more important. Choosing the right fit should outweigh how it looks. Try on as many helmets as you need to in order to find one that fits perfectly. Helmet sizes may vary from brand to brand, so it’s always best to look at the specific brand’s helmet size guide. For example, here’s the helmet size chart from Fox. Even if the actual sizes are the same for two brands, the shapes may differ, so you still can’t rely on one size to fit across the board. Also, read reviews such as our review of the Fox V1 Helmet – they’ll clue you in to how the helmets fit (if they run small, large or true to size). 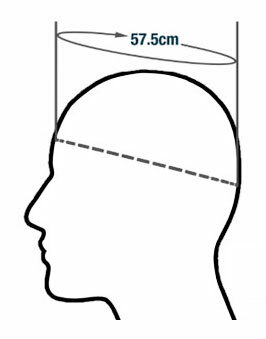 To measure your head for the right fit, use a soft, tailor’s measuring tape and measure your head’s circumference (around your entire head) starting one inch above your eyebrows. Make sure to measure the fullest part of your skull in this area. Compare your measurement to the sizing chart. Wearing a helmet isn’t enough to protect you – it needs to fit correctly in order to do its job. Even though most brands have accurate size charts, you’ll want to perform a few quick tests to make sure you have the right fit. Make sure to do this before your first ride with the new helmet – you’ll have time to return it and get a new one if needed, and you won’t be tempted to ride with an ill-fitting helmet. As you take your motocross helmet off and put it back on, it should feel a bit snug, but not so snug that it’s uncomfortable or painful. If it’s not snug enough, try adjusting the strap before trying on another helmet. Comfortably tighten the chin strap, then shake your head hard in all directions (left, right, forward and backward). There shouldn’t be any extra movement in the helmet. If the helmet slides, you need a smaller fit. See if you can put one finger between the helmet’s padding and your forehead. If you can, you need a smaller size. Put your hands under the back of the helmet and pull it forward. You shouldn’t be able to pull it over your head. If you have someone with you, ask them to try to roll the helmet off your head from the back by pushing up from the base of the helmet. If you can get it off, it’s too large and it’s likely to come off in a crash. Make sure to wear the helmet for a few minutes before deciding whether or not you should keep or buy it. If you’re trying it on in a store, walk around with it on for a few minutes. Don’t feel pressured to buy a motocross helmet until you’ve given it a good try. According to SHARP, as many as 14% of fatal injuries occur when a helmet comes off of the head during an accident. Your MX helmet should be a bit snug. This way, it can stay in place and perform as it’s supposed to, keeping your head and face safe if you get into an accident. However, you shouldn’t notice any pressure points or tight spots. After wearing your helmet for a few minutes, you may notice that certain places only become more and more uncomfortable. In this case, try on a different size or shape of helmet. Note that this doesn’t necessarily apply to the cheek pads, unless they’re causing pain. You’re fitting the helmet to your head, not your face, and cheek pads tend to soften up after a few rides. It’s good if the helmet feels slightly snug around the cheeks. Every day, clean your helmet and visor. After riding, let wet paper towels sit on the visor for a few minutes, then wipe the visor and helmet clean. Every week, clean out the vents and intakes with a toothbrush or cotton bud. Every month, remove the lining and cheek pads and wash them according to the manufacturer’s instructions. Every six months, clean the interior of the helmet by wiping non-removable pads with a damp cloth, then letting the interior dry on its own. When storing your helmet, be sure to keep it somewhere where it can’t be knocked down or fall easily. It’s best to store it in a helmet bag and you should never store it by laying it on its crown. Keep the helmet out of extreme heat or sunlight, which will negatively affect the helmet’s structure. If you want to personalize your helmet, have it done by a professional who has the right products to use on a motocross helmet. Regular paint and stickers can weaken the shell. Your helmet won’t last forever, even if you never have an accident. However, if you do have an accident or if the helmet is impacted (during a fall, crash, hitting your head or dropping it on a hard surface), you need to replace it immediately. Motocross helmets are only protective for one crash – after that, its safety qualities are reduced and it’s no longer safe to ride with. If you’ve dropped your helmet and aren’t sure if it needs to be replaced, the first question to ask yourself is how hard you dropped it and onto what type of surface. 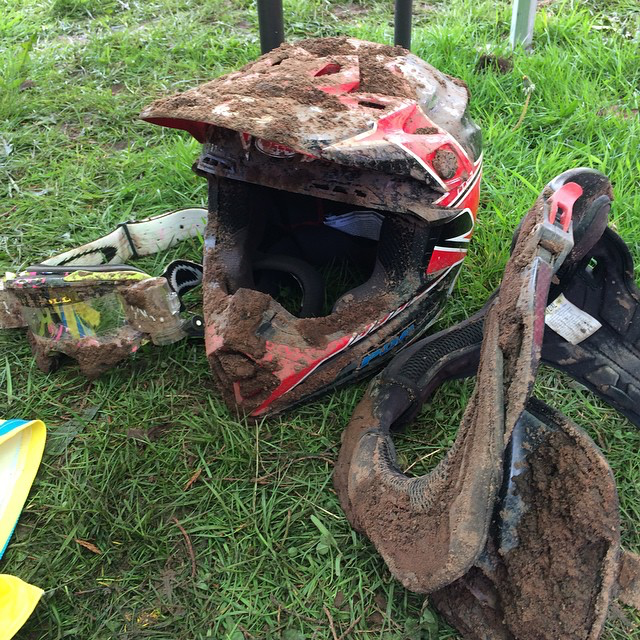 Dropping your motocross helmet hard onto a hard surface means you’ll need to replace it. Also, look for things like scratches, chips or dents – this means the helmet has been impacted and should be replaced. Even if your helmet hasn’t been impacted in any way, it will still go through normal wear and tear over time. The padding and lining can get worn down, which can result in it losing its form or tearing away from the helmet. This means it’s time to replace the helmet, especially if you use it on a consistent basis. If you haven’t had a crash of any kind, haven’t dropped your helmet and haven’t noticed any wear and tear of the lining, consider replacing your helmet every five years, even if it’s in perfect condition. It’s even better to replace it every three years or to go by the schedule that the manufacturer suggests. It’s possible that the helmet has been compromised but that there aren’t any visual signs, which means you’re not as protected as you think when you ride. Motocross helmet makers are always coming up with new protective technology, so upgrading your helmet to a newer model may keep you safer. Motocross gear is constantly changing and advancing. Staying up-to-date with the latest in accident prevention technology as well as UK regulations will keep you well-protected. The more you invest in your motocross gear, the more you invest in your future. Accidents happen, even for professional riders. Having the right helmet can mean the difference between resting up at home for a few days with minor bumps and bruises and needing to be hospitalised because of a life-threatening injury. You wouldn’t start riding your motocross bike without knowing how it works and how to handle it; you wouldn’t continue riding it if it was in need of service. Purchasing motocross gear, especially something as important as a helmet, should be approached with the same care and consideration.